“Captured by the Sea” is an evolving body of work documenting sun-seekers at the beach in Italy and France. A play-on-words, the title of this series communicates the state of mind of my subjects, as well as the act of my photographing them. When I create these images, I work as an invisible observer of the people and landscape unfolding around me. As I look through the viewfinder of my camera, I turn down the imaginary volume dial in my brain and quietly study the scene. Every detail has significance, from colors and textures, to facial expressions and body language. It is the juxtaposition of these details in the foreground, mid-ground, and background of the photograph that lends an otherwise unremarkable scene a surreal, dreamlike quality. My goal is to create photographs with enough detail and content that they encourage curiosity and provoke a creative narrative within the viewer. Does she know she’s catching a sunburn? Are they lifetime lovers, or getting fresh for the first time? Do the lifeguards watch the children or their mothers? Are the lone sunbathers seeking solitude or the chance of meeting someone in the surf? Are they too, captured by the sea? The Ethereal Landscape is a selection of photographs that spans multiple subjects and locations, but share the same dreamlike quality that is a hallmark of my photography. A beautiful landscape is so much more than an awe-inspiring vista. I like to think that my photography peels away the layers of those vistas until the tranquility of the natural world is revealed. From the snow-capped highlands of Iceland to the foggy shores of the Pacific and Atlantic oceans, I seek fleeting moments where the atmosphere and environment intersect. This series evokes a timeless sense of intangible beauty that is found in the textures of water, earth, weather, and natural light. I find myself completed fascinated by the various bird species that migrate through the pacific northwest. 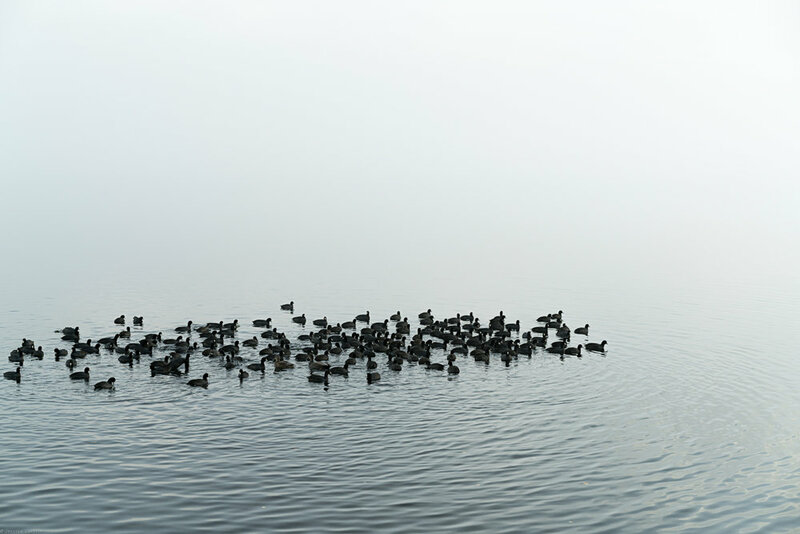 This series focuses primarily on snow geese, coots, and mallard ducks (with the occasional swan). I find that birds have a special way of transforming a landscape, especially when it includes water and weather. Often, the density of fog or the lack of current in the water will create an ethereal and mysterious aura. This passing precipitation has the power to completely erase the horizon line and cause the water and sky to become a blank canvas. And while I find the weather in and of itself always interesting, birds bring complexity and texture to the negative space, and provide action to a scene that is otherwise be perceived to be an empty, tranquil void. If only I could convey the deafening sound of a massive flock, my story of migration would be complete.